These beautiful DIY Printable Wedding Signs are are a simple yet elegant way to add (another!) special touch to your wedding. Can't you just see one at your ceremony or reception? These also make great gifts. I am often asked how to print these. 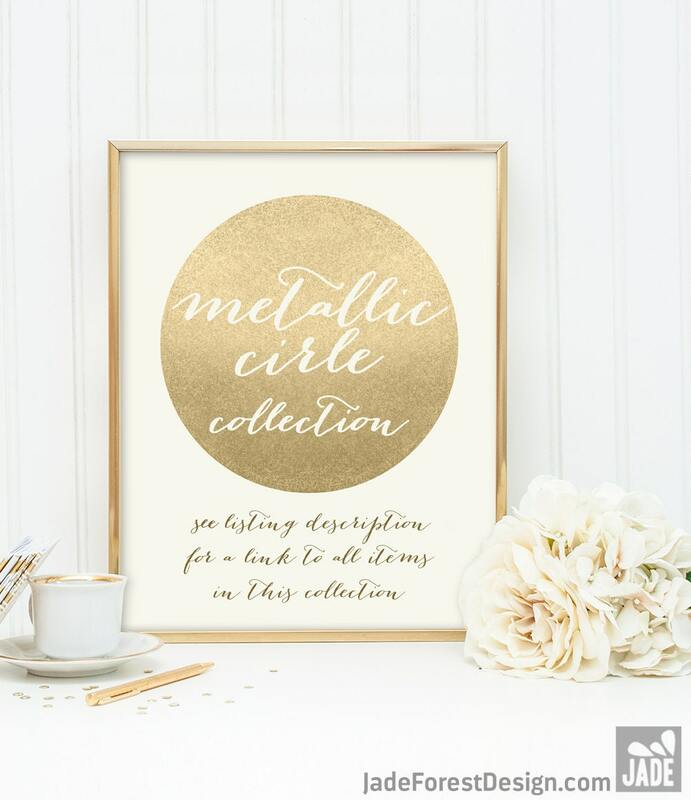 This design does not use metallic ink, or actual glitter. 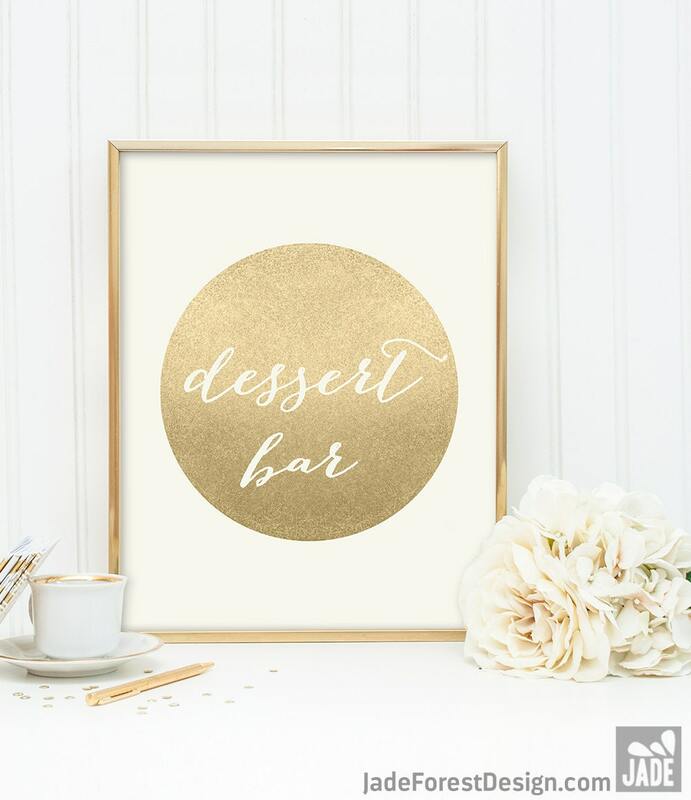 It's a digital faux metallic image, which imitates the look of metallic ink/foil, including the highlights and shadows created by light. It is printed on regular white paper. My customers have been very happy with the results this creates. This listing is for the design EXACTLY AS PICTURED only. You will receive a digital file only. No physical item will be sent. There may be some color difference between what you see on your screen, and what comes out of your printer. 1. Go to You > Purchases and Reviews and look for the order. © 2018 JADE FOREST DESIGN. All rights reserved. Finished files are emailed within 4–7 business days for REGULAR turnaround, and 1–3 business days for RUSH. Portrait files take 5–10 business days (with different rush options). For printed items, printing and shipping takes an additional 6–8 business days from proof approval. • REVISIONS add 1–2 business days each, 2–3 business days for portraits. Please see the "description" of each individual item for most up-to-date turnaround times and rush options. I can accommodate any number of guests and tables, and organize the chart by table or alphabetically at no extra charge. ✦ up to 100 guests … 16" x 20"
✦ 100–150 guests … 18" x 24"
✦ 150–200 guests … 24" x 36"
Please note that you MUST use the template. It greatly reduces the chance of errors. You should have received an email from 'transaction@etsy.com' with a link to your Instant Download items in the email account registered with Etsy. Please check your email, including the Junk folder. 1️⃣ Do NOT use the Etsy App. You need to use a browser (on your computer, smartphone or tablet). 2️⃣ Go to Etsy.com, and log in with the account you used to make your purchase. 3️⃣ Go to You > Purchases and Reviews and look for the order. 4️⃣ To the right of the order, click the BLUE “Download Files” BUTTON. This goes to the Downloads page for all the files attached to your order. ➤ PORTRAITS: How are they made? What do I need to send? The portraits are personalized based on your info and photos. Outfits are customizable as well. ➤ Include clear photo(s) of all the people and/or pets to be illustrated. Well lit, camera-facing photos are best, and separate photos are fine. Custom scenery is NOT included. Unfortunately shipping is only available within the US and Canada for invites, menus, programs etc (US only for signs).